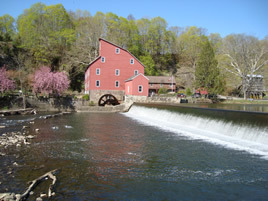 In 1912, the legislature of the State of New Jersey instituted laws relating to the construction, repair, and inspection of existing and proposed dam structures. The law was amended in 1981 and became known as the Safe Dam Act. 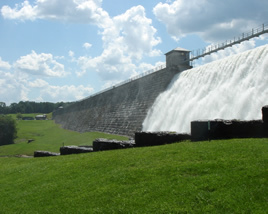 New Jersey's Dam Safety program is administered by DEP's Division of Dam Safety & Flood Control, Bureau of Dam Safety, under the rules and regulations promulgated in May 1985 known as the Dam Safety Standards. Dams under State jurisdiction are artificial barriers, together with appurtenant works that raise the waters of a stream more than five feet above the usual mean low water height. The primary goal of the program is to ensure the safety and integrity of dams in New Jersey and, thereby, protect people and property from the consequences of dam failures. In the past 25 years, our nation has experienced a number of dam failures that resulted in the loss of life and extensive property damage. Fortunately, New Jersey has not had the misfortune of experiencing a catastrophic dam failure but there have been an increasing number of small dam failures. This is largely attributed to the lack of maintenance and inspection as well as the fact that many of the dams in the state are nearing the end of their design life. Lakes and reservoirs provide numerous recreational opportunities, wildlife habitat and scenic views to enhance enjoyment of our natural surroundings. Water stored in these impoundments serve our daily needs and satisfy the requirements of business, industry and agriculture. Too often, we take these valuable resources for granted. Our lakes and reservoirs would not exist without dams. When all of us begin to recognize these concerns and responsibilities, the importance of dam safety becomes obvious. The Bureau of Dam Safety reviews plans and specifications for the construction of new dams or for the alternation, repair, or removal of existing dams and must grant approval before the owner can proceed with construction. Engineers from the Bureau evaluate each project, investigate site conditions and check recommended construction materials. 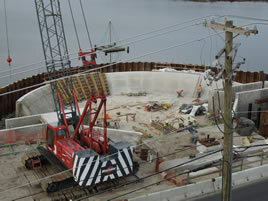 During construction, engineers identify conditions that may require design changes; check for compliance with approved plans and specifications; and approve foundations before material is placed. Existing dams are periodically inspected to assure that they are adequately maintained and owners are directed to correct any deficiencies found. The regulations require the owner to obtain a professional engineer to inspect their dams on a regular basis. These investigations include a comprehensive review of all pertinent material contained in the Department's files, a visual inspection, technical studies when necessary and the preparation of a comprehensive report. The Bureau also coordinates with the Division of State Police, local and county emergency management officials in the preparations and approval of Emergency Action Plans. Since failure of a dam can take only hours or minutes, it is imperative to have a detailed emergency action plan ready for use. For specific information on dams in New Jersey please contact the Bureau of Dam Safety. The directions included on this web page you are about to link to are to the main DEP building located at 401 East State Street. We are located just down the street at 501 East State Street at the corner of East State Street and Clinton Ave. We are immediately adjacent to the public garage as shown on the map.